There is an increasingly rich diversity of faith and life stance communities in Norway, urging the church to convey Christian cultural heritage in new ways. Understanding one’s own culture and traditions is important when you meet someone with a different faith or life stance. It creates a platform of respect and open-mindedness. On the night before first Sunday of Advent, thousands of eleven-year-olds come to churches all around the country and spend the night there. They take part in the Wide Awake program where they learn about church and faith through playing, listening, singing and preparing a service. They organize practical tasks, learn hymns and songs, act out Bible texts and formulate prayers. They eat together, and when it gets late, they pray evening prayer in the choir of the church, roll out their sleeping bags and sleep in the church room. They become familiar with the church by experiencing fellowship, activity and rest there. And on the following morning they are the hosts of and key contributors in the parishes’ Sunday services. This program is a result of the Christian Education Reform from 2003. 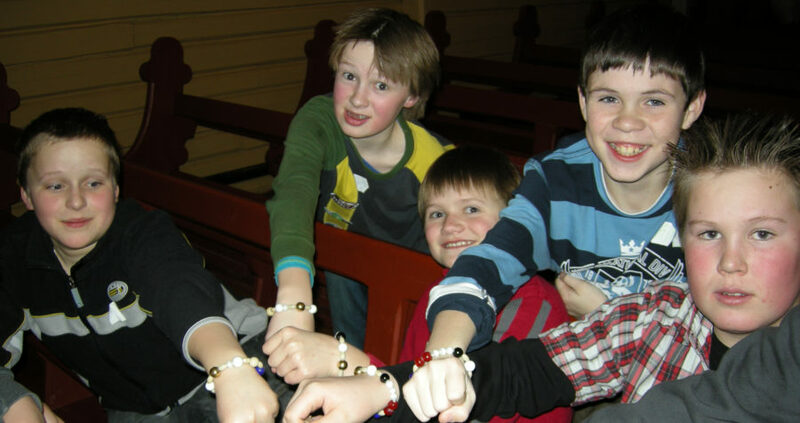 Through the reform, all parishes in the Church of Norway have developed local plans for Christian education for the age group from 0 to 18 years. The plans include well-known, common activities such as preparations for baptism and confirmation, as well as new, national initiatives based on pilot projects developed in parishes and organizations, facilitated by the Church Council. The Wide Awake program is one such initiative. In developing a local plan for Christian education, every parish explores what specific premises and possibilities they have, and start from there. In the following, the municipalities of Gildeskål, Lom and Skjåk, and Bamble have been chosen as examples of how church rituals are sustained, renewed and concretized. Above: From the Wide Awake program, Nordberg Church. Photo: Annie Holien. The coat of arms of Gildeskål municipality is a Eucharist cup. The oldest and most evocative building in Gildeskål is the well-preserved church from medieval times. People have come from near and far to this church and the graveyard surrounding it for over 800 years. Historically, Gildeskål has special connections with the cathedrals in Nidaros and Canterbury. Both these cathedrals were among the most important pilgrimage sites of Western Europe from the 12th century onwards. Christian education in Gildeskål should reflect this, without overemphasizing history. In Christian education, the church cooperates with, among others, Skjåk hunter and fishing association, the handicrafts association, the rural women’s society and Skjåk folk dance association. Emphasis is put on using local art and culture. For example, the local instrument two row accordion is used in the church music, and the local griddle cake used for celebratory occasions, “avlette”, is used as Eucharist bread – baked by Skjåk rural women’s society. Seated on bales of hay, the confirmation class celebrates barn mass around Christmas time and learns about Francis of Assisi and the first nativity scene. In Bamble parish, Christian topics are examined through Bible stories and other stories about faith, and through activities both indoors and outdoors. The stories are tied to local history and the unique site of the church. Within a small radius, you will find Bamble church from 1845, the parish hall, the parsonage, the ruins of the Olav church from 1150, including a Mary chapel, burial mounds, old sunken roads, “Skeidihelleren” which is thought to be a medieval settlement, and the hill fort at Storås. 1. The church is not a museum. The churches are houses in active use that have been built in various different eras with various designs. In their own different ways, the church buildings and church sites convey the larger, shared story of Christian faith and tradition. The church buildings and church art can both teach us about different handicraft traditions and give each of us a possibility to explore faith through others’ interpretations of faith symbols and stories. We have seen some examples of how Christian education also encompasses cultural heritage at a local, national and global level. In their local Christian education plans, the parishes ask themselves: “What do we have here in our local community? An old church site? Part of a pilgrim’s route? A hymn writer? A storytelling priest? Are we a church in a coastal culture or a mining community?» Starting with such questions, a contextual Christian education is developed that connects young people with traditions and cultural heritage. What happens when faith is shared in this way? New generations encounter words that are up to several thousand years old, from the Bible and from liturgies. Old traditions are practised in new settings and in changing times. The holidays are celebrated with a shared message and diverse expressions, binding us together across borders. Songs and hymns are sung in church services, in educational settings and at home. In Christian education, children and youth learn old songs that have been sung by generations before them, as well as new expressions of what faith is and how it is lived.